the smartphones that reimagine the way people communicate, share and experience the world. Made for an age in which consumers increasingly communicate and express themselves more with images, videos and emojis, the Galaxy S9 and S9+ drive innovation with Samsung’s advanced camera. 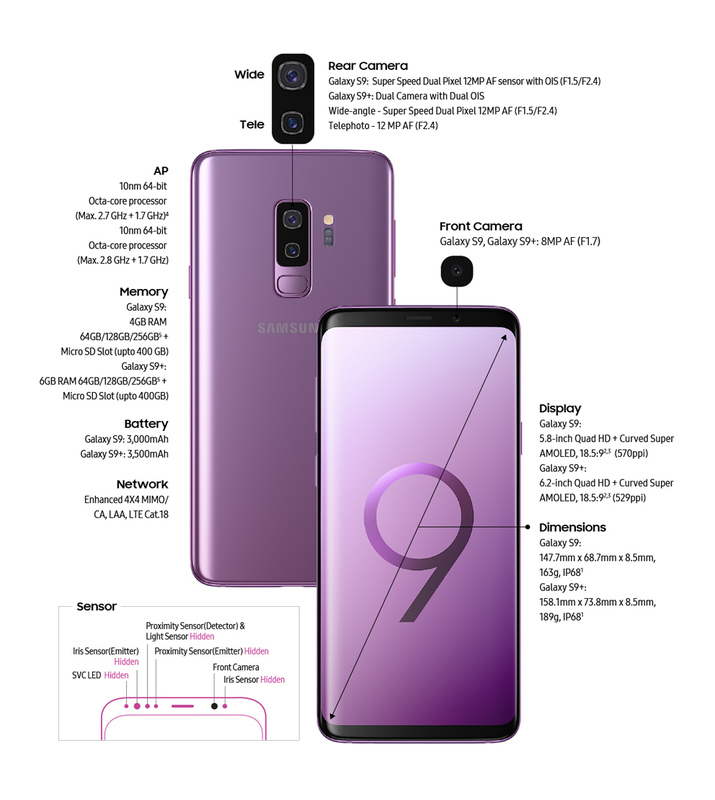 Redesigned with a new Dual Aperture lens that powers an innovative low light camera, Super Slow-mo video capabilities and personalized AR Emoji, the Galaxy S9 and S9+ ensure users do not miss a moment and make their every day epic. The Galaxy S9 and S9+ deliver an enhanced entertainment experience with powerful stereo speakers tuned by AKG, immersive audio with Dolby Atmos® and a refined edge-to-edge Infinity Display1 – a key staple in Samsung’s design heritage. In addition, the Galaxy S9 and S9+ will come with the new SmartThings app, which unites Samsung’s existing IoT services into one single, smart experience. said DJ Koh, president and Head of IT & Mobile Communications Division, Samsung Electronics. Today’s cameras are for more than taking pictures – they’re for connecting and communicating. Consumers want a smartphone camera with state-of-the-art technology, so they can express themselves with high-quality images and tools to tell their own, unique story. The Galaxy S9 and S9+ cameras are built with these consumers in mind, with a Super Speed Dual Pixel sensor with dedicated processing power and memory to take amazing shots with high photo quality. Make everyday moments epic with dynamic, slow-motion video that captures 960 frames per second. The Galaxy S9 and S9+ also offer automatic Motion Detection, an intelligent feature that detects movement in the frame and automatically begins to record – all users have to do is set up the shot. After capturing the Super Slow-mo video, users can select background music from 35 different options or add a tune from their favorite playlist. Users can also easily create, edit and share GIF files with a simple tap in three playful styles of looping to watch the action over and over again. Good lighting is the secret to any great photo. But often, photos are taken in less-than-ideal lighting conditions and most smartphone cameras have a fixed aperture that can’t adjust to low or bright lighting environments resulting in grainy or washed out pictures. Similar to the way the iris of a human eye expands and contracts, Samsung’s Dual Aperture2 (F1.5 / F2.4) automatically lets in more light when it’s dark and less light when it’s too bright, taking photos that are crisp and clear. Samsung lets users create an emoji that looks, sounds and acts like them. AR Emoji uses a data-based machine learning algorithm, which analyzes a 2D image of the user and maps out more than 100 facial features to create a 3D model that reflects and imitates expressions, like winks and nods, for true personalization. AR Emoji shares users’ real-life emotions not only in video but also with a range of stickers and uses a standard AGIF file format so users can share their emojis across most third-party messaging platforms. the Galaxy S9 and S9+ and will connect to other Samsung and non-Samsung devices. The Galaxy S9 and S9+ take health to the next level with an improved optical sensor built directly into the device, providing richer, more accurate information on users’ health status. This sensor allows the Galaxy S9 and S9+ to keep track of users’ Heart Load Factor, a new measurement of the real-time demand placed on the heart8. 1 Based on test conditions for submersion in up to 1.5 meters of freshwater for up to 30 minutes. Rinse residue/dry if wet. 3 Default resolution is Full HD+ and can be changed to Quad HD+ (WQHD+) in Settings. 5 May differ by country and carrier. User memory is less than the total memory due to storage of the operating system and software used to operate the device features. Actual user memory will vary depending on the operator and may change after software upgrades are performed. Wi-Fi 802.11 a/b/g/n/ac (2.4/5GHz), VHT80 MU-MIMO, 1024QAM, Bluetooth® v 5.0 (LE up to 2Mbps), ANT+, USB type-C, NFC, Location (GPS, Galileo, Glonass, BeiDou)13. 11 May differ by country and carrier. Follow our in-depth coverage of the Galaxy S9/S9+.